The Big Booster programme, which has attracted all kinds of start-ups, has become the stage of a new cooperation for Metropole de Lyon, which is soon to host the final. Indeed, through this challenge, the city has been able to promote its desire de support the development of new and innovative companies working in health, digital, biotech, environment and sustainable development sectors. A desire which is shared by Boston; a city that is also committed to these sectors. During the Big Booster Bootcamp, an agreement was signed between the two cities in the presence of Karine Dognin-Sauze, Vice-President of Innovation, Smart Cities and Digital Development at Metropole de Lyon, and Marty Walsh, Mayor of Boston. – Culture, education and the development of tourism. This agreement, aimed at uniting Boston and Lyon in their strategic ambitions, be they: entrepreneurship, biotech, cleantech or robotics, also touches on social, cultural and environmental issues, which are important to both parties. This agreement also represents the opportunity for Lyon and Boston to mobilise various actors (companies, public structures and universities) to promote sustainable urban development. According to the Vice-President of Metropole de Lyon, this agreement will enable further exchanges between the city and its various partners. 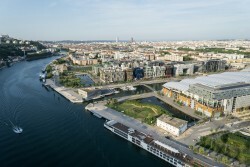 In the long term, it will certainly promote Lyon’s status as an increasingly propitious region for start-ups, both in terms of quantity and quality with the development of new solutions, including one straight out of Boston: a Cambridge Innovation Center (CIC): a facility that can accommodate a number of start-ups within the same building to capitalise on the mass effect. The next step? Further exchanges between Lyon and Boston will lead to the drafting of an entente between the two mayors to formalise this agreement.